Today I released an update of a simple but pretty useful macOS Today Extension widget: Calendar Widget. After I switched from Linux + KDE to macOS, I suffered from lack of various stuff, one of which is a simple calendar widget, which is accessible with one click on the system panel. As soon as I started using macOS, I began to look for alternatives. As for calendar, I found two projects: Today Scripts and Calendar. The first one is a quite simple widget that only allow to display an output of a shell script. It is enough to display the current month, but there is not way to get additional features working, such as Go to next/previous month. The second one seemed exactly what I needed, unfortunately, the original project and all its forks were abandoned, so I started to maintain my own version. There isn’t anything particularly complicated except that Apple loves to change the Aqua appearance. 10.10 Yosemite, 10.11 El Capitan, and 10.12 Sierra used fully dark Notification Center, the original version of Calendar was designed for these versions. 10.13 High Sierra significantly changed it and the Notification Center became fully white regardless of system settings. It required to change all colors used in the app. Finally, 10.14 Mojave introduced two different themes: Light and Dark. As you might expect, Mojave required making new changed in the Calendar widget. But in fact, Mojave does most of the work for you, and the only thing developers should do is to use semantic colors (such as selectedTextColor, linkColor, etc.) in their application or create a custom color set. All these steps are comprehensively described in the Apple article about supporting new Dark Mode. Surprisingly, Apple has never explained what NSExtensionPointVersion parameter actually does. 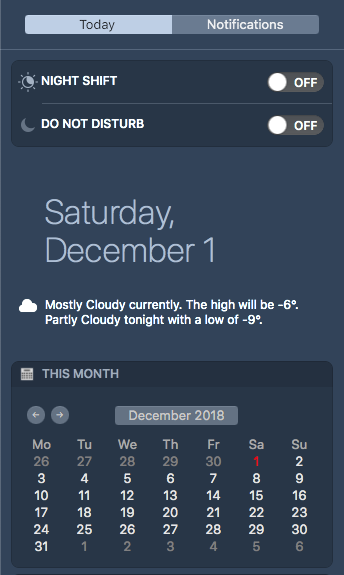 You can grab Calendar Widget app on the Releases page: just extract it to somewhere, double-click and add a new widget in the macOS Notification Center.